…I’ve often been asked about fear: when you’re that far from home and a million things could go wrong, aren’t you afraid? Well, we were afraid. True fear is the fear of the unknown, and all our training had been geared towards eliminating the unknown as much as possible. 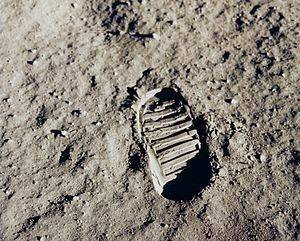 For a month before the flight we’d worked 12 hours a day, at times on a simulated lunar surface, tromping around in a sand-filled litter box’ that took up slightly less room than a tennis court, with heavy equipment on our backs. As combat pilots and in flight-testing aircraft, we learned to either cope or get out. I did feel a tinge of stage fright. I think we both did. Perhaps the worst moment was when Houston announced that the President wanted to talk to us. My heart rate, which had been low during the entire flight, suddenly jumped. One quarter of the Earth’s people were listening on radio or watching on TV. We were alone, but the immense feeling of being watched probably hampered our operation slightly. But it also gave us the adrenalin to keep functioning. 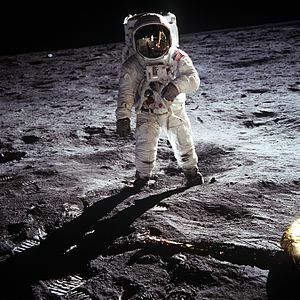 My strongest memory of those few hours on the lunar surface was the constant worry that we’d never accomplish all the experiments we were scheduled to do. There wasn’t time to savor the moment. It seemed as though what we were doing was so significant that to pause of a moment and reflect metaphysically was really contrary to our mission. We weren’t trained to smell the roses. We weren’t hired to utter philosophical truisms on the spur of the moment. We had a job to do. I do remember that one realization wafted through my mind when I was up there. I noted that here were two guys farther away from anything than two guys had ever been before. That’s what I thought about. And yet, at the same time, I was very conscious that everything we did was being closely scrutinized more than 240,000 miles away. As we left the surface to re-enter the spacecraft, we performed a brief ceremony. I reached into my shoulder pocket, pulled out a packet, and tossed it out onto the surface. It contained a patch commemorating the three American astronauts who had perished when their spacecraft was engulfed in an explosive fire during the simulation test for the first Apollo flight. Next there were two medallions in memory of Russian cosmonauts who had also died. And then there was a disc containing messages from the heads of state of 72 countries. I hope that it helped you. Thanks for taking the time to stop by the blog and make a comment.